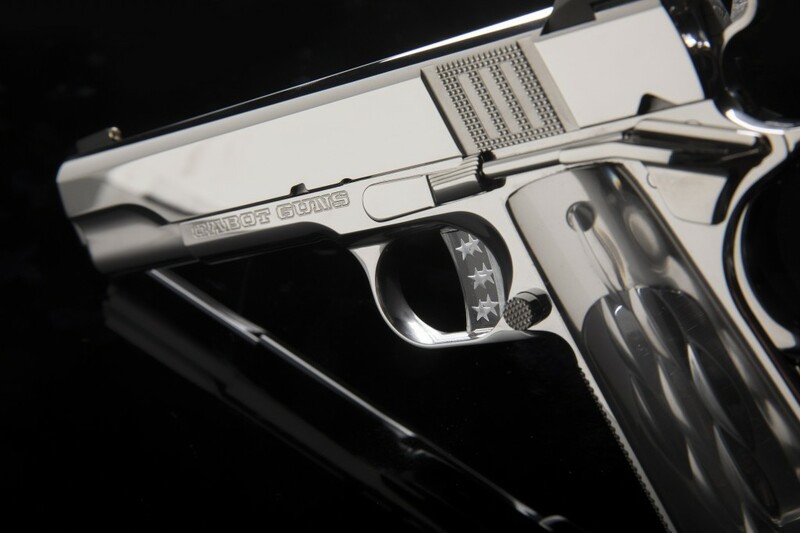 OUR ONE-OF-A-KIND, FIRST-OF-ITS-KIND CRYSTAL GUN UNITES TWO FORMS OF ARTISTRY FOR ONE SINGULAR EFFECT: A CABOT’S AEROSPACE TOLERANCE 1911 MEETS TOP GLASS ARTIST, BRIAN ENGEL. The idea started in 2015 when I was introduced to the glass artistry of Brian Engel through a mutual friend. At the time, Brian was helping manage the Pittsburgh Glass Center, a hub for the glass arts where the art of traditional glass blowing is taught and practiced. I was awestruck by the beauty of his glass art and the delicate refined work Brian had created. His work, which often tries to capture natural scenes in soft, elegant colors, was a complete juxtaposition to seeing Brian in person. Brian is a former Navy Damage Controlman, an avid outdoorsman and firearm enthusiast—not your typical glass artist to be sure. After a couple of meetings, the project was born. 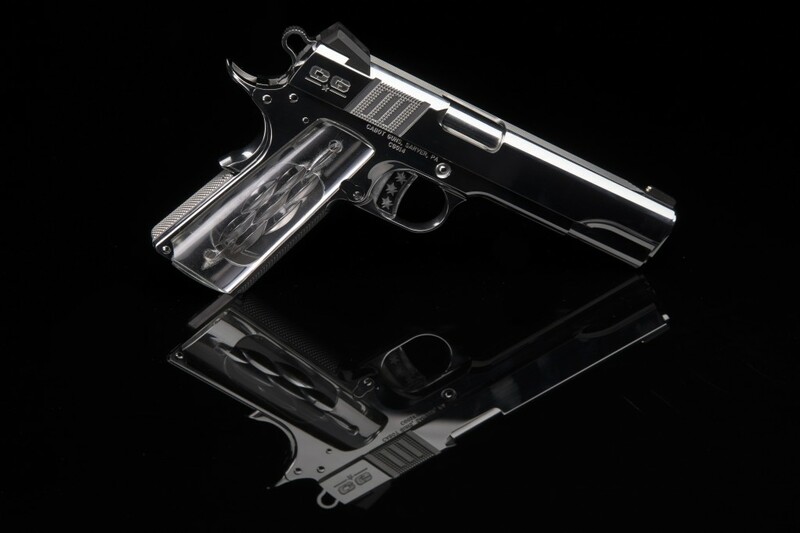 We determined the elements of the Crystal guns to be crafted in lead crystal would constitute the grips, the trigger and a glass case. The creation of something that has not been done before is not easy and this was no exception. The process of creating the crystal grips was iterative and extremely challenging from a craft perspective. Making 1911 pistol grips out of optic crystal takes some prototyping. One doesn’t just carve the glass and voila, there are your grips. Not at all. Engel had to produce seven sets of prototype grips before he had perfected the process and was able to create the final grips. The trigger was a similar story. It took two sets of trigger prototypes to get it right. The triggers also began with a solid block of optical glass. He cut them into slices using the water-fed saw with the diamond blades. Engel had to grind the slices to an exact thickness. To accomplish this, he ground the slices down in eight steps. He first step was done with an 80 grit slurry of silicon carbide and water. Each successive grinding cycle used a finer grit, getting all the way up to 800. 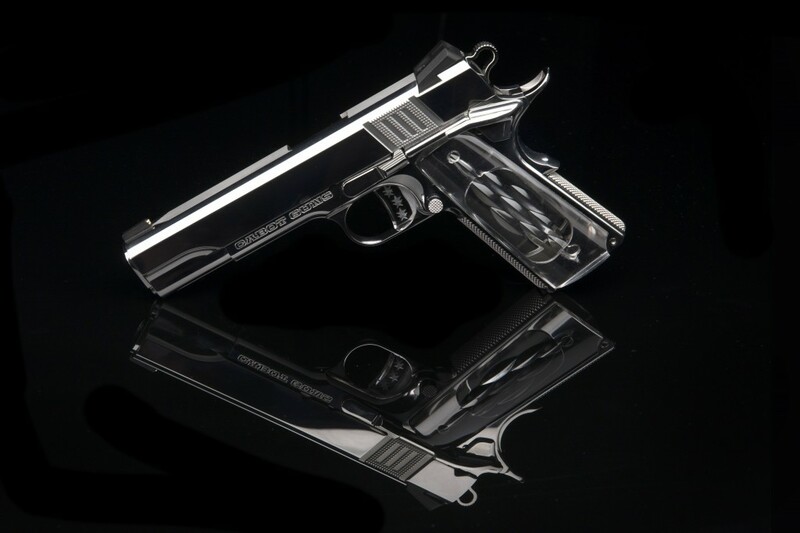 The base of the gun’s case was custom made from lead crystal casting glass. The lid was formed from bonded float glass. To create the case, Engel started by building a wood frame with beveled edges. This created the outer boundaries of the case. Inside this frame, he made an impression of the gun in a bed of clay to the depth that the actual gun would rest inside the finished case. Then, Engel poured a mix of plaster and silica over the wood and clay mold to create the negative shape of the glass case. This created a mold that Engel could use to cast the glass. He loaded the plaster-silica mold with chunks of lead crystal glass and melted them in an electric oven. The casting process took over five days, with the glass at a temperature of 1600 degrees Fahrenheit. After casting, Engel ground and smoothed the case’s mitered edges and the top surface of the glass by hand. This “hand lapping” process involves grinding the glass case with another piece of flat glass and a silicon carbide slurry. He then polished these surfaces using pumice, a horsehair wheel, a felt wheel, and polishing compound—a series of steps that took 40 hours.